Whopper's Bunker: What happens when you put an Arab flight crew in France? What happens when you put an Arab flight crew in France? 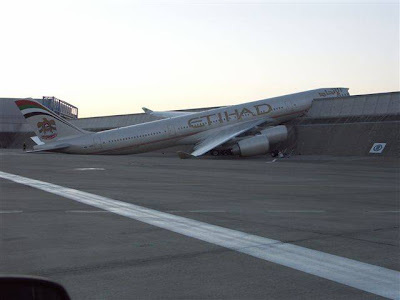 A brand spanking new Airbus 340-600 sat in its hangar in Toulouse , France without a single hour of airtime. Enter the Arab flight crew of Abu Dhabi Aircraft Technologies (ADAT) on November 15, 2007 to conduct pre-delivery tests on the ground, such as engine run-ups, prior to delivery to Etihad Airways in Abu Dhabi . The ADAT crew taxied the A340-600 to the run-up area. Then they took all four engines to takeoff power with a virtually empty aircraft. Not having read the run-up manuals, they had no clue just how light an empty A340-600 really is. The takeoff warning horn was blaring away in the cockpit because they had all 4 engines at full power. The aircraft computers thought they were trying to takeoff but it had not been configured properly (flaps/slats, etc.) Then one of the ADAT crew decided to pull the circuit breaker on the Ground Proximity Sensor to silence the alarm. This fools the aircraft into thinking it is in the air. The computers automatically released all the brakes and set the aircraft rocketing forward. The ADAT crew had no idea that this is a safety feature so that pilots can't land with the brakes on. 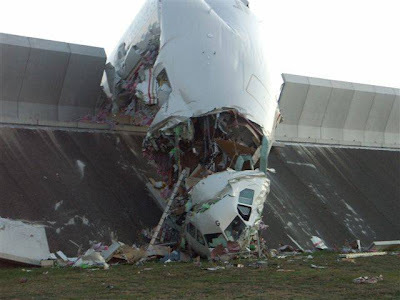 Not one member of the seven-man Arab crew was smart enough to throttle back the engines from their max power20setting, so the $200 million brand-new aircraft crashed into a blast barrier, totaling it. The extent of injuries to the crew is unknown, for there has been a news blackout in the major media in France and elsewhere. Coverage of the story was deemed insulting to Muslim Arabs. Finally, the photos are starting to leak out. What happens when you put an Arab flight crew (the insane) in France (the incompetent)?